Versatility and adaptability are essential attributes in a successful building business, along with an ability to be unflappable under pressure – all qualities Angus and Laura Chisholm have in abundance. After all, over their many years in the building industry they have developed excellent relationships with clients and have completed a diverse range of building projects. The highly experienced and skilled building company has recently commenced a prestigious building project in Wanaka for architect David Sheppard, of Sheppard & Rout. Closer to home, the company has built a fabulous new home in Rolleston that ticks all the boxes and is priced to sell. Angus Chisholm says the home is an “entertainer’s delight with a high end finish”. The 339sqm property is situated at 48 Riverstone Drive and has plenty of room for the whole family. On a 1076sqm section, it’s located in a new subdivision, off East Maddison Road, zoned for West Rolleston Primary School, Rolleston College and Lincoln High and conveniently located just five minutes from supermarkets, shops and cafés. It consists of four bedrooms (plus office) with built in wardrobes. 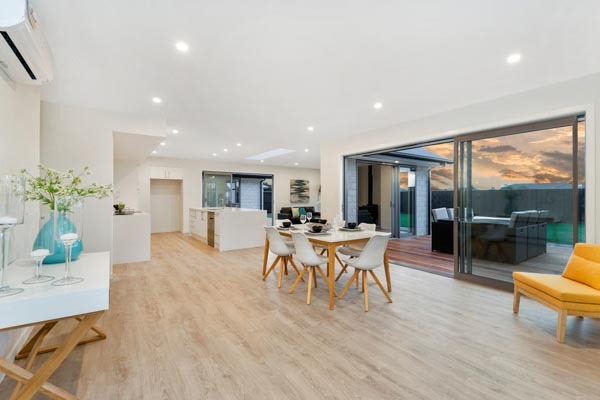 Central to this home is the spacious and sun drenched open plan kitchen/family zone that connects the dining and the two living spaces to both north-facing outdoor entertaining areas and large lawn. It also has a quadruple garage and workshop. Angus says the home is a “perfect example” of its building style and gives clients a visual appreciation of the techniques engaged. Contact Angus Chisholm Builders Ltd on 022 477 8270 or email anguschisholmbuilders@xtra.co.nz.